Coventry City have told the English Football League that their preferred option is to stay at the Ricoh Arena next season. The EFL gave the League One club until 17:00 GMT on Tuesday to provide an update on where they plan to play their home fixtures in 2019-20. Their existing agreement with landlords Wasps expires in the summer. And the Sky Blues could face expulsion from the EFL if a satisfactory resolution cannot be found. Chief executive Dave Boddy told BBC Coventry & Warwickshire that staying at the Ricoh was the club's "only feasible option". Coventry's owners Sisu are still in a legal dispute with the city council and Premiership rugby union club Wasps, the stadium owners. Both have said that they will not enter negotiations about extending Coventry's stay while that is ongoing. 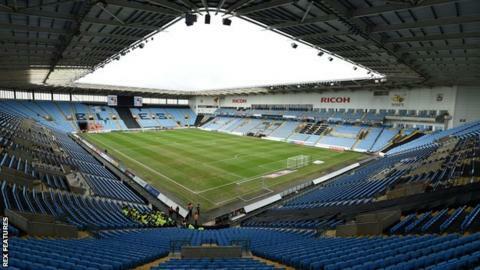 Sisu claim Coventry City Council undervalued the Ricoh Arena by £27m when it was sold to Wasps in 2014. If an agreement between the parties cannot be reached, EFL clubs will vote at an Extraordinary General Meeting on 25 April to decide the Sky Blues' future. Coventry, who spent the 2013-14 season in a groundshare at Northampton Town, have been told by the EFL that they must play their home games within six miles of the city centre. A meeting involving representatives from Coventry City, Wasps, Coventry City Council and the EFL is expected to take place at Westminster next week to discuss the next steps. Speaking to BBC Coventry & Warwickshire on Tuesday, Wasps chief executive Nick Eastwood said it would be a "major disaster" if the Sky Blues were to go out of business and emphasised that it was a scenario nobody at the club or in the city would want. However, Wasps' stance regarding the ongoing legal issues was reiterated. "The football club and their owners have a very simple choice," said Eastwood. "They can either pursue us in the court or we can enter discussions for them hopefully to play at the Ricoh. The Sky Blues posted a statement on their club website "demanding answers" from Coventry City Council about a commitment that was made in 2014 to preserve the "security and future" of the club when agreeing to any deal for the stadium. Council leader George Duggins told the BBC: "I think we fulfilled that. "There had been a four-year lease agreed and it was a two-plus-two arrangement because it was always anticipated that the football club would build a new ground and that hadn't changed. "The people who are risking the future of the football club are Sisu themselves and nobody else." Asked where he would like to see Coventry playing home games next season, Duggins said at the Ricoh Arena. Coventry first played at the Ricoh in 2005-06 after more than a century at the club's former Highfield Road home, and signed a fresh agreement in February 2018 for them to stay at the stadium this season. But chairman Tim Fisher said on Monday that the club had to consider "exploring other options that could ensure the club's future" if the impasse with Wasps continues. Boddy added: "We have to plan for the future of this wonderful football club. We just can't let it die. We have to do whatever we can to find a solution."